"Seven Memories of Media Technology"
If you participate in this work, you will see a line as a boundary between you and others, which is usually supposed to be invisible, to identify your territory. The boundary changes according to the position of each individual on the floor, but the rule is that the person at the center must always be the closest to the boundary. This line-producing program relates to the "Voronoi Diagram" and "Dirichlet Boundary Conditions", which are used to analyze natural phenomena with mathematical rules: patterns of ethnic settlement, animal dominance, or plant competition in anthropology or geography, the arrangement of atoms in a crystal structure in chemistry, the influence of gravity on stars or star clusters in astronomy, and so on. The boundary that surrounds participants does not exist on their own but changes in a subtle way like conflicts between the individual and society. This work is named after the title of a dissertation submitted to University of Michigan in 1967 by Dr. Theodore Kaczynski, also known as the "Unabomber", who was a gifted mathematician but secluded in a forest for 25 years and sent mail bombs that he made himself to various people. Scott Sona SNIBBE's primary focus is to create works that react to human movement and gestures in order to encourage viewers to take proactive actions and offer them interactive experiences even if they are not interested in the work or they do not know each other. He studied computer science at Brown University and experimental animation at the Rhode Island School of Design. His video works have also received global recognition. Currently based in San Francisco and teaching at a college while working as a computer scientist for Adobe Systems Incorporated. Since 1990, the development of high-speed computers and sensors that detect human gestures and changes in the environment has attracted a great deal of interest as an aspect of artwork: An artwork can now become independent of its creator and be understood differently depending on the viewer. 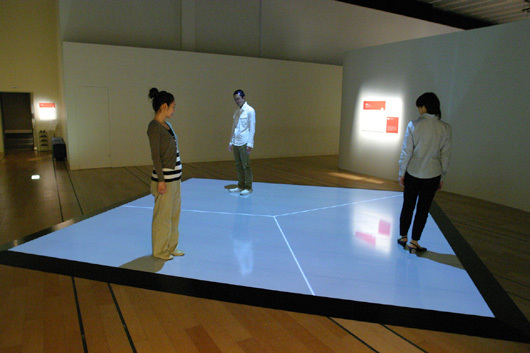 Prominent characteristics of "Interactive Art" are that the work can function only when viewers proactively participate in it, and that the work never stays in a single status as it changes over time in reaction to how viewers operate it or move around it.